A fantastic pair of travertine side tables. Eye-catching, modern forms of great proportion and subtle detail. Though hollow underneath, mitered travertine slabs built to imply one massive structure with a decorative bevel along the top perimeter. Beautiful figuring all-over with a subtly gradating oatmeal hue. Monumental and impressive utilitarian items. 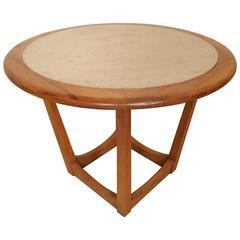 Mid-Century Modern walnut side table with stone insert. Attractive open base and smooth edged top. (Please confirm item location - NY or NJ - with dealer). 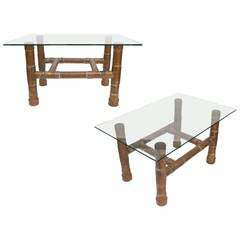 Pair of wrought iron and travertine 'Entretoise' side tables by Design Frères. Chic pair of versatile side or end tables. Also great as a two-part coffee table. Indoor or outdoor use. 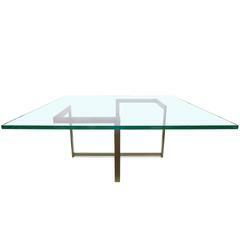 Pair of square brass, glass and lucite side tables. A pair of beautiful natural stone Travertine Roche Bobois style end or side tables. These can also be used as coffee tables. Dimensions: 17.75" H x 31.5" W x 31.5" D.